I just had to show off a fun Halloween treat that I made including the cone at the bottom of the bag and gift tag. 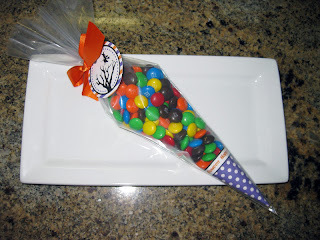 The candy was placed inside of a piping bag, but you can fill it with lots of fun treats like trail mix or gold fish. This makes a great party favor or treat for an employee or teacher.